Pikachu DS - Tech Demo! 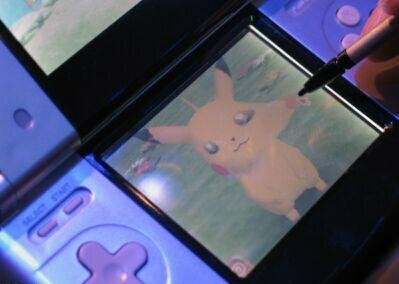 Pikachu DS, a Tech Demo to show off the power of the Nintendo DS, or a future game? This gorgeous demo highlights the versatility of Nintendo DS by showcasing brilliant colors and switching the true 3-D view from screen to screen as Pikachu runs around. Players use the stylus and touch screen intuitively to interact with Pikachu in a variety of different activities. Players can touch and pull Pikachu's cheek directly, draw Pikachu posed or rub to shave off a scratch card. Chances of this coming out as a game are slim as Nintendo states quite clearly that, and I quote, "Think of tech demos as a glimpse into what the future might hold. These short examples allow players to interact with their games in ways they never have before. Just to show how easily and naturally DS games can be played." Then again, who knows what the future holds...maybe we will see this Hey You Pikachu style game again.